Help us record new Trumpeter Swan migration history as it is being made! Your reports of marked (collar, wing tag or leg band) or unmarked swans help us track swan movements to new areas. When you report a marked swan (collar, wing tag, or leg band) to the Bird Banding Lab and The Trumpeter Swan Society, you help track new migration sites and resting areas for specific birds. These two wing-tagged Ontario swans were reported in a new area of Pennsylvania. The white swan is more than a year old (swans grow white feathers following their molt in their second summer), and the gray swan is a cygnet about 9 months old. Swan parents teach their young migration routes, wintering sites, and how to survive in the wild. Sadly, with the near extinction of Trumpeter Swans by 1900, came the loss of migration traditions and knowledge of local landscapes. Swan restoration programs in the 1980s in the Midwest included collection of Trumpeter Swan eggs from Alaska. The swans hatched from those eggs had no knowledge of the Midwest landscape. As swans began to slowly return to the landscape, they had to pioneer and learn new migration traditions, find secure wintering sites, and discover nesting habitat in areas where they had been gone for more than a century. Were swans finding their way south? How far did they migrate? Where were their migration rest stops? Were new swan families finding nesting habitats near where they hatched or farther away? We didn't know the answers to many of those questions. We knew we could rely on people just like you to help discover the answers. Your swan sightings have made a difference to what we know about swans! 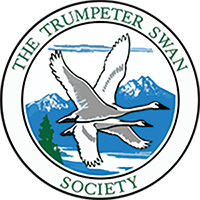 "Trumpeter Watch" is your opportunity to help us learn about areas where Trumpeter Swans are spending their winters and summers, and the migrations time in-between. We share your sightings with swan managers across North America. All banded/marked birds must be reported to the Bird Banding Lab by the bander. Through your reports, the bander learns the location of a particular bird and you receive a report with information about the swan- its age and where and when it was originally banded. 2. Report your swan sighting to us! Use our quick and easy online swan report form! You can upload your photos with our online reporting form. Your swan sightings can be marked (with collars, leg bands etc) and unmarked birds. Observe with care! Approach swans slowly. Keep enough distance to avoid causing them to leave. We welcome photo submissions to document your sightings when possible. These can be uploaded directly online, or in email, or you can post them to The Trumpeter Swan Society FACEBOOK site. We offer many useful tips, including vocalization recordings, in Swan Identification. At times, it is quite challenging to distinguish Trumpeter Swans from Tundra Swans, particularly cygnets. When possible, attach or upload a photo and we will help confirm ID. Even if the species cannot be determined with certainty, if you are in an area where wintering swans are unusual, your observation could be quite helpful to identify a site's future potential. Note name of state, county, closest town or recognizable location such as a lake, park or refuge. Our online report page has a link to identify your GPS coordinates. To the best of your ability, note age class. Adult birds are white, juvenile birds (cygnets) are gray. It's helpful to report the total numbers or estimates of Trumpeter, Tundra, or unidentified swans. Your comments about behavior are helpful and interesting as well, e.g., feeding, flying overhead, loafing/resting. General notes on other species in the area are of interest, such as in mixed flock with 300 Snow Geese, etc. If you would like, you can include even more information. Are the swans near humans or are there human activities in the area (e.g., snowmobiling, boating, recreation, etc). Are there any obvious hazards (e.g. powerlines, nearby developments) or do swans seem happy and non-stressed? If Trumpeters are regularly using a location in your area, your photos are especially helpful. We invite TRUMPETER WATCH reporters to join TTSS. Your support will help us share Trumpeter Watch findings with swan managers across North America. Your tax-deductible donation is put to work right away to help us work with swan managers on swan conservation issues. Thank you!